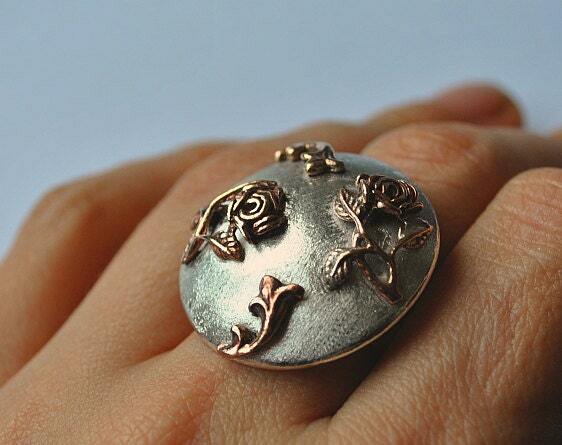 I decorated this dommed sterling silver adjustable cocktail ring with copper flower roses and swirls. I polished the roses and the swirl to a mirror shine to make them pop up as an accent. This ring is my own design. It is an adjustable ring. Ready for shipment. All my jewelry is handcrafted by me in Turkey and it is new, unworn. The ring will come in a cute gift pouch which I offer for free. Shipping upon receiving of cleared Paypal payment by registered air mail through Turkish Post. Approximative delivery time: 4-8 days to Europe, 6-16 days to U.S.A. and Canada. If you have a problem with jewelry purchased from me, as long as the damage is not due to an intentional abuse, my warranty coves the repair. I also offer free repair of minor wear and tear. Be ready to pay the shipping both ways.